As a brand steeped in prestige, Mulberry’s knowing ability to conjure up an ideal rustic image of Somerset, or at least an image of English Arcadian pastoralism, is in part down to putting all their chips on marketing a localised outreach, which subsequently extends around the globe. And on Friday in the ceremonial county in question, Somerset, Deputy Prime Minister Nick Clegg christened a second British Mulberry factory, entitled The Willows. The new branch, set to double the brand’s UK production capacity, takes its name from the nearby Willow Man sculpture by Serena De La Hey, which commemorates the role of willow in the ecology and craft tradition of the rustic Somerset Levels. 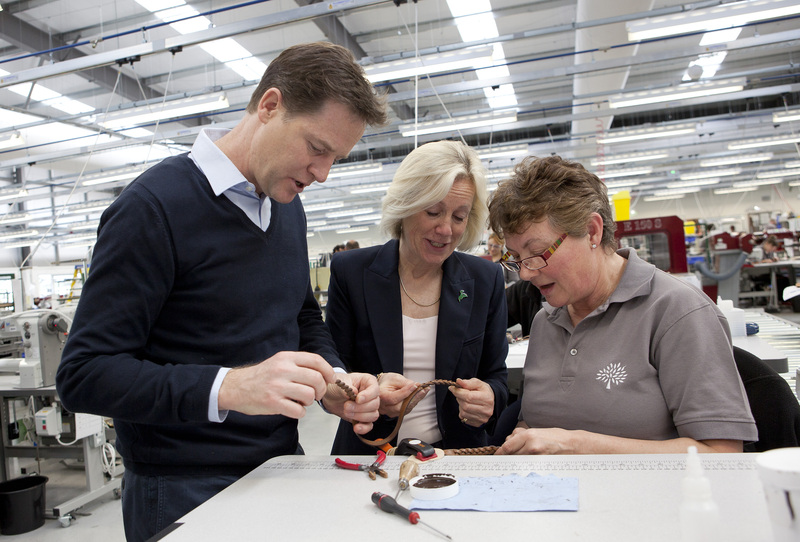 With a noble oath pertaining to a British luxury brand investing in British production dating back to the 1970s, it would have been a disservice not to consider Mulberry for the Government’s Regional Growth Fund, and Clegg, leader of the Liberal Democratic party, has been open about his joy for offering assistance to help the brand expand. 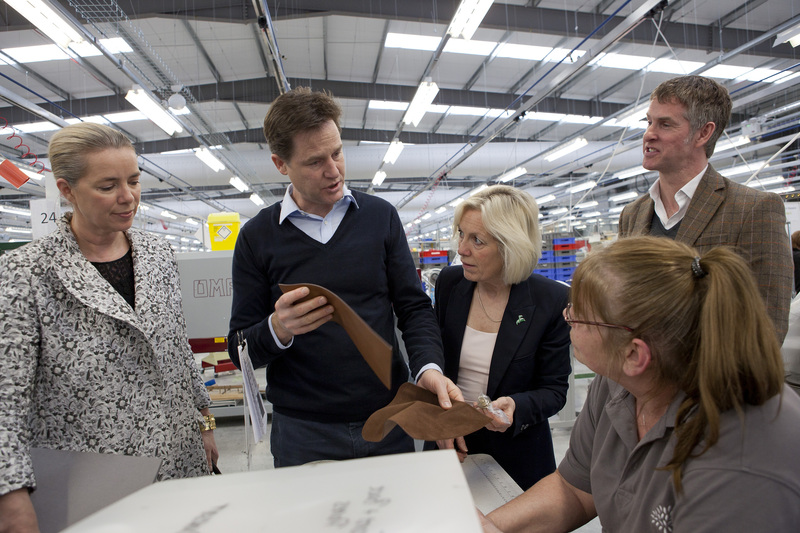 Coming forward with his views, Clegg spoke only recently of how “companies like Mulberry and the people who work here are helping us to build and stronger economy and a fairer society for this generation and the next”. 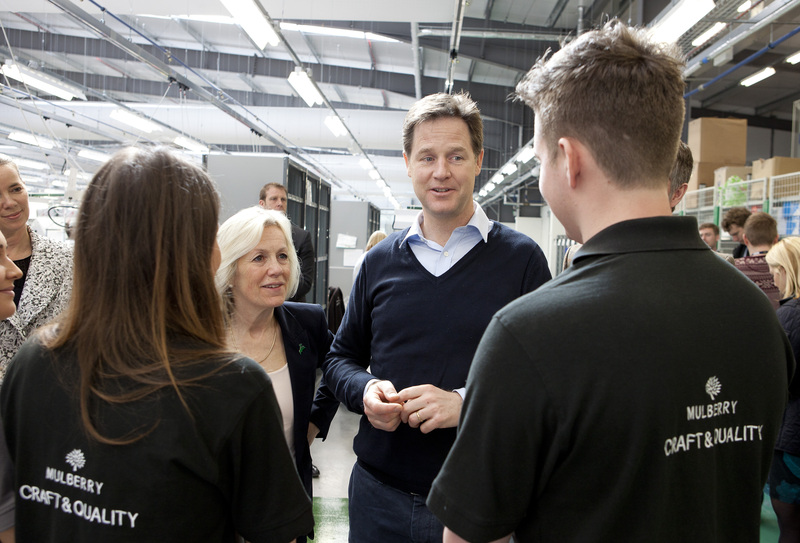 The politician also praised Mulberry’s apprenticeship scheme, explaining that it was the “second time I have met the apprentices from Mulberry, who always impress me with their drive, enthusiasm and skill”. The apprenticeship scheme was set up in 2006 to ensure that new generations of Mulberry’s UK workforce could be taken in by the brand and, in conjunction with the local Bridgewater College, offered certified training in Leather Goods Manufacturing. Now considered the benchmark of apprenticeship schemes within the industry, it has laid the foundations for The Willows, constantly attracting many high-calibre applicants which eventually become the craftsmen and women of the future, with a number of roles emerging for them to fill. Though it is already the largest manufacturer of luxury leather goods within British shores, The Willows reflects a £7.5 million investment in home-grown manufacturing, with the government’s strategy allotting a further £2.5 million towards recruitment and training costs, and naturally, following Mulberry’s time-honoured tradition, employees will be recruited from the local area. Mulberry’s cooperation with the neighbouring communities of its countryside haven does much for both the residents concerned and the image of Britain beyond London, and for a fairly young label, with a very British steadfast agenda, the brand’s spirit is case in point that heritage doesn’t necessarily have to extend over centuries.